I know, I know, you can’t believe it. I actually made an entree that isn’t chicken! It took me a loooooooong time to start eating fish again despite the fact that I used to go fishing with my dad. We ate fresh fish quite often, not to mention that mashed up fish sticks smothered in lemon-butter was one of my favorite meals. Like, ever! And although I’m sure I could probably scarf down a McDonald’s Filet-O-Fish if I really wanted to, generally I can’t stand fishy-fish. 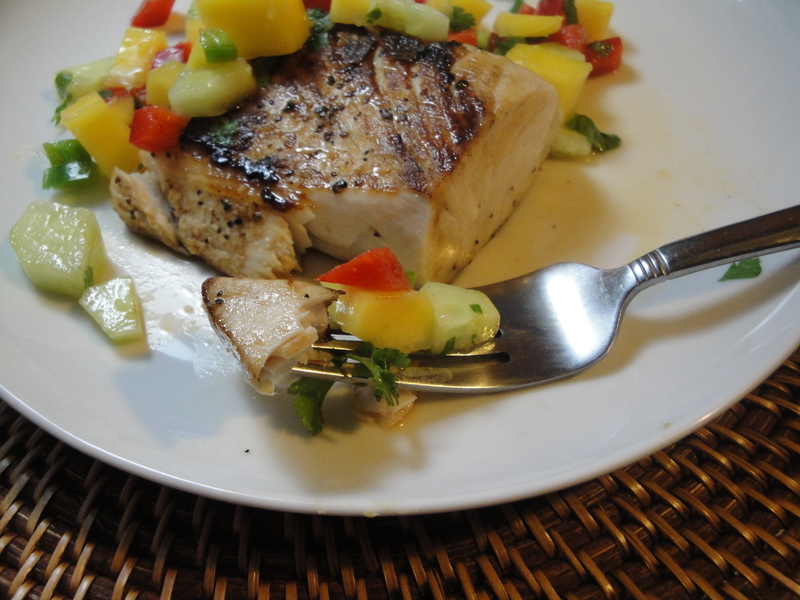 I’ve had a couple of mahi recipes tucked away that I haven’t had the nerve to make but after eating mahi mahi two (maybe three?) times in Florida over the weekend, I figured it was time to step up and get over my fear of cooking fish. 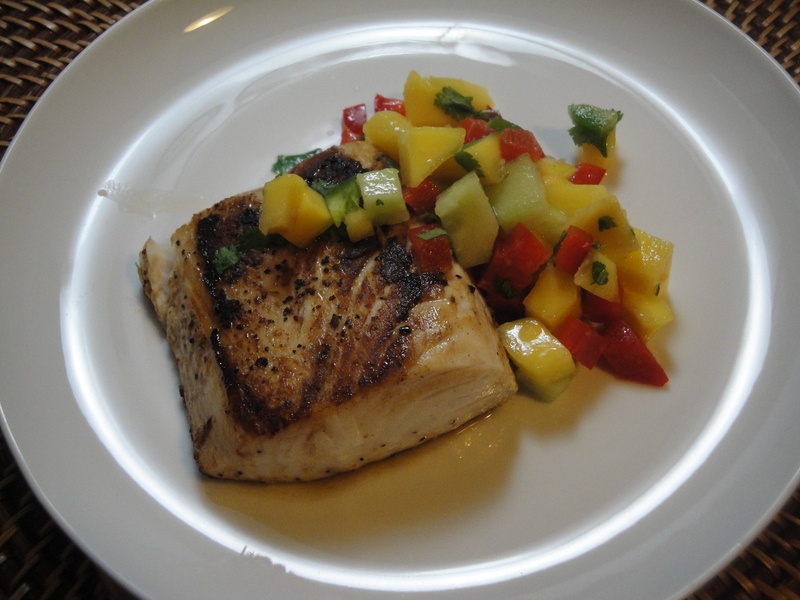 This Grilled Mahi Mahi with Mango Salsa seemed simple enough and luckily, I had all of the ingredients for the salsa already. The fish is briefly soaked in a mixture of coconut milk and lime juice before being cooked in a grill pan (although I used a regular pan). 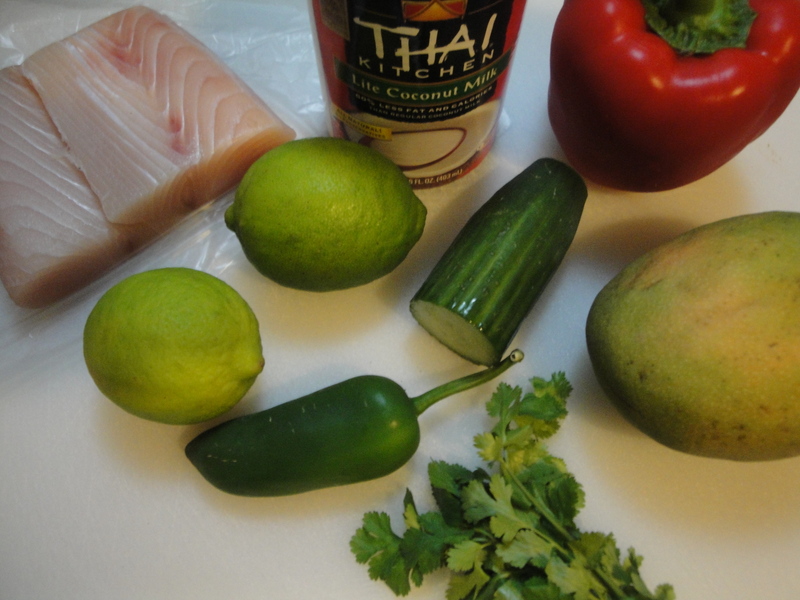 The salsa is filled with flavors of mango, cucumber, red pepper, ginger and jalapeño (the recipe calls for serrano) which taste super-yummy with the mahi mahi. I’m no longer afraid to make fish at home anymore so this was a big step for me! 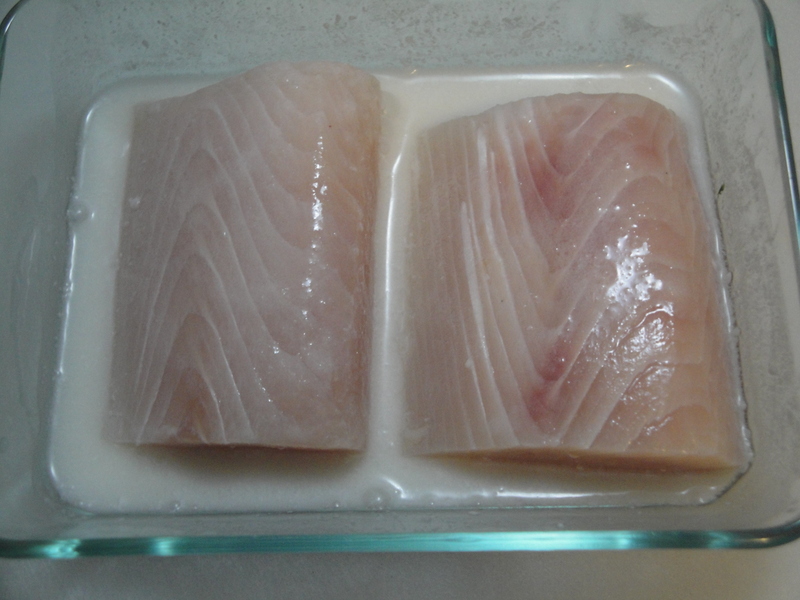 Combine coconut milk and lime juice in a shallow dish and add the fish. Turn a few times to coat and let sit for 15 minutes at room temperature. 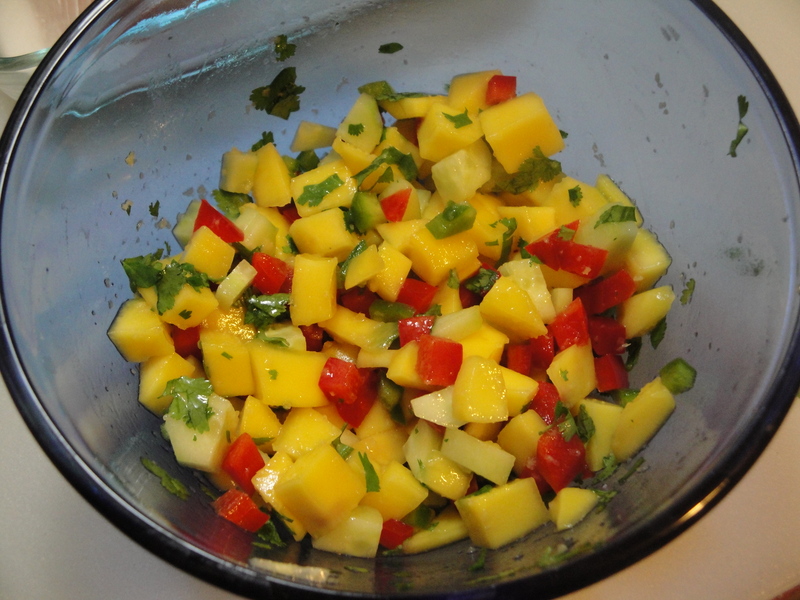 Meanwhile, chop the mango, red pepper, cucumber, cilantro, ginger, cilantro and jalapeño (and onion, if using) and place in bowl with remaining coconut milk and lime juice. 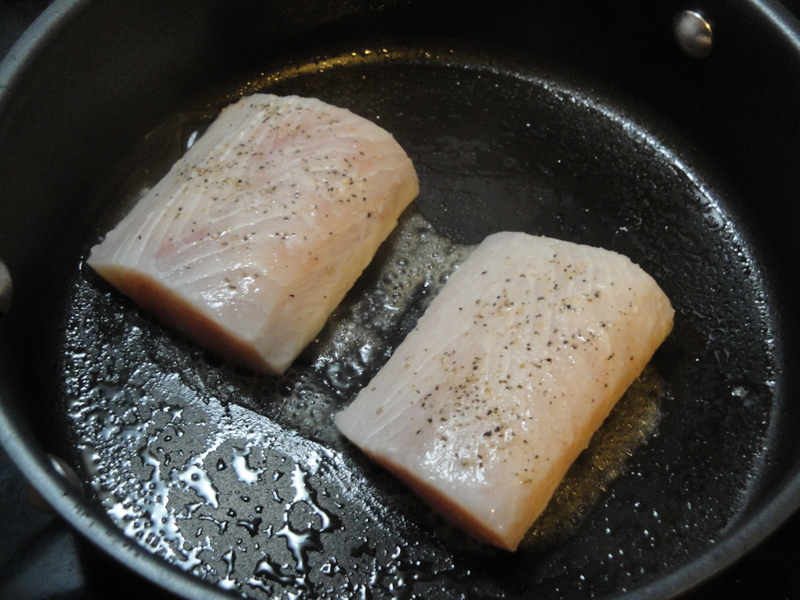 Remove fish from the marinade and season with salt and pepper. Place in a grill pan heated over medium-high heat. Cook for 4 minutes on each side or until fully cooked (mine took an extra 2 or 3 minutes). My fish was on sale for $5.99 a piece – not too cheap! And that was the sale price! But worth every bite!